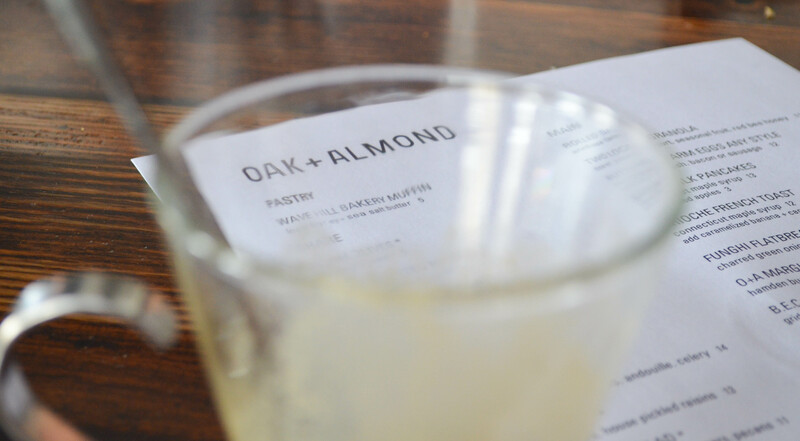 Last week, I got back from a business trip in the city and met up with The Bedfellow to check out brunch at a relatively new restaurant, Oak + Almond, in Norwalk, Connecticut. This was a group event, with bloggers from all over Connecticut, designed to allow us to taste the scope of the menu and relax on a lazy, cold afternoon. As this was more of an event than a critique, I’m going to reserve numerical judgment and focus on the dishes and ambiance of the restaurant. Like many events, this particular one was comped, but we did leave a gratuity for our ebullient server at the end. 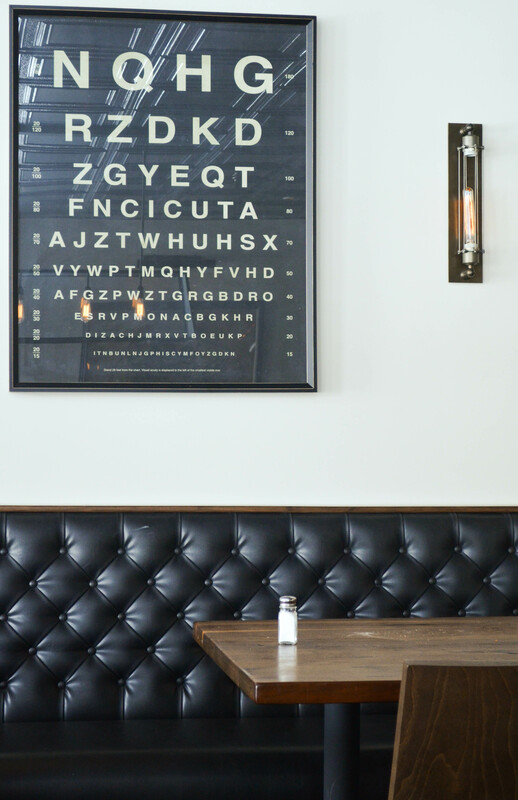 We started with a massive selection of small plates– honestly, I think we ate the entire menu, and a few drinks. Okay, more than a few drinks. 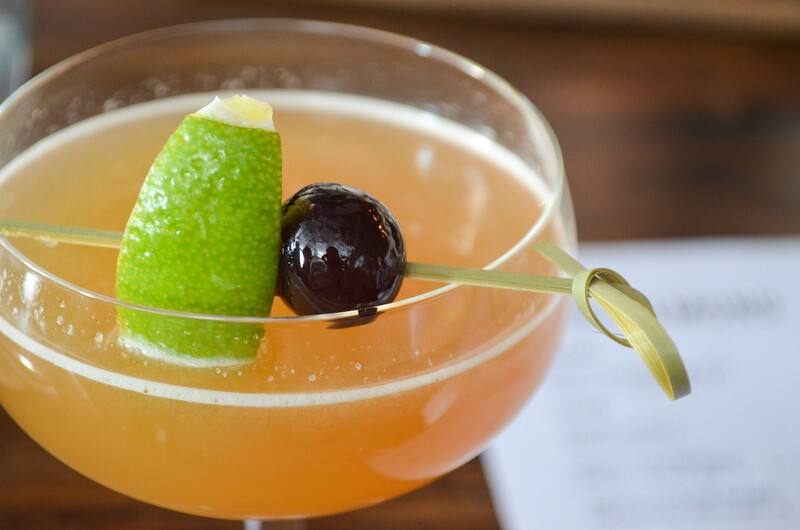 We’d debriefed the drink list ahead of time and decided on the When There’s Smoke, with scotch, sherry, almond syrup, lemon juice, and cayenne and cocoa powder on top, and a bang-up Aviation, with Broker’s gin, creme de violette, lemon juice, and a maraschino cherry. I highly recommend both- it was a great way to start the day. The former, smoky but surprisingly bright and citrine, went well alongside the sweet, herbaceous Aviation. I’d never tried Broker’s before- or if I had, it was so good that I didn’t remember it. This was a decent gin, clean and crisp for mixing with more rich, flamboyant liqueurs. 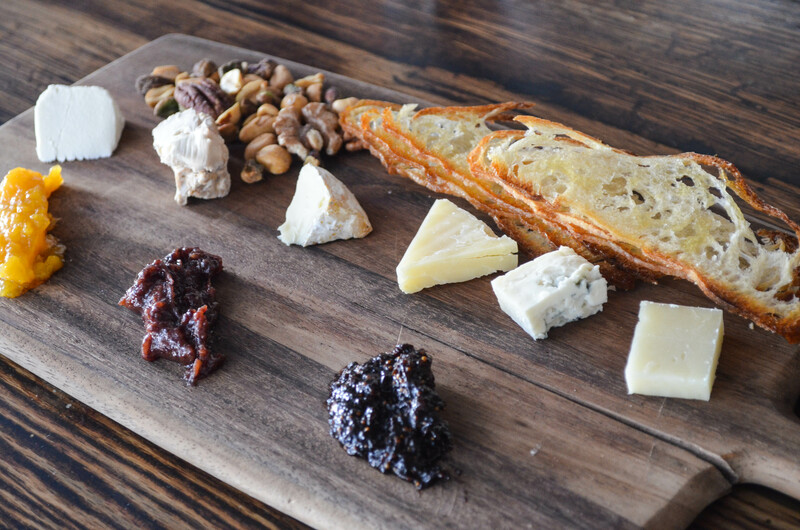 Drinks in hand, we moved on to a cheese board, with six cheeses, all American-made, and three housemade preserves. This was a marvelous selection, served alongside duck fat-roasted nuts, crispy crostini and slices of thick foccacia with honey butter. I stuck to a creamy goat cheese with a stupid good tomato and lemon jam, bright and acidic. I did note that the cheese portions were very, very tiny– 1-2 oz. apiece, on the smaller end, but wasn’t sure if this was the standard presentation or portioned for our tasting. 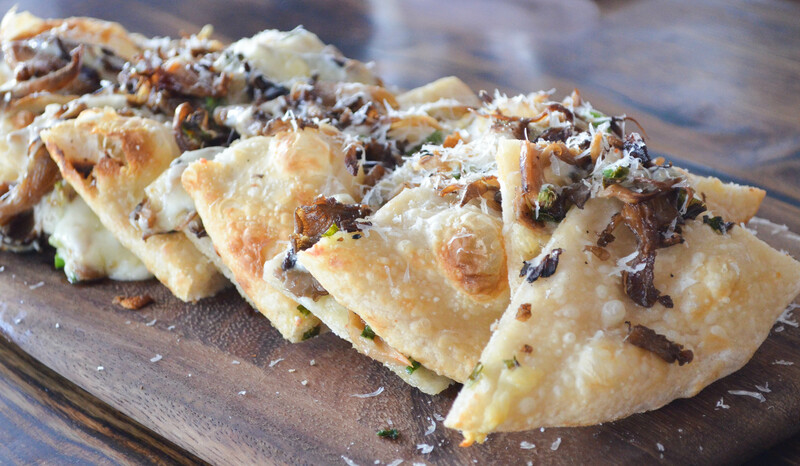 This was the funghi flatbread. I did not sample it, for obvious mycologic fear, but it disappeared shortly after this photo was taken, so it must have been tasty. Also present was a savory margherita flatbread. We were also given a dish of the octopus, the only other plate I opted out of. My ethical stances are far and few between, but one of them happens to be not eating octopus. They’re ridiculously smart, and I admire things that can retrieve their own snacks out of jars. Nevertheless, this went quickly, too. 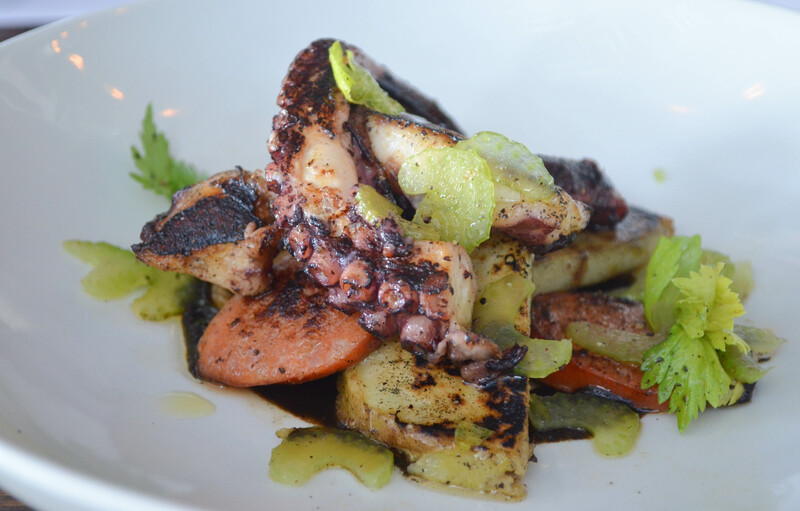 It was grilled and served alongside guajillo and squid ink sauce, potatoes, andouille sausage, and celery. 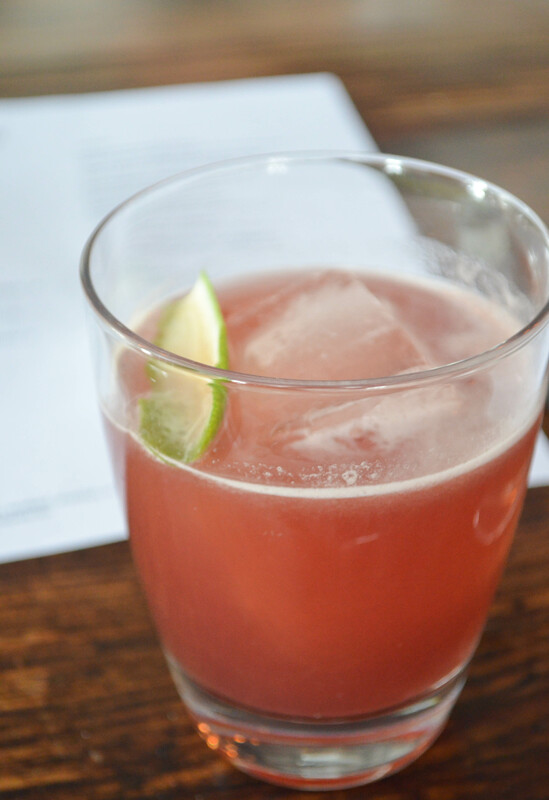 Round two yielded the Hemingway Daiquiri, with 12 yr. rum, a maraschino cherry, fresh grapefruit, and lime juice. This had an oddly appealing, vegetal tang to it, and we couldn’t discern where the savory note originated from. Very smooth, with a richness to its texture from the rum. The Bedfellow had the Oak + Almond, and for a namesake drink, it definitely impressed, with bourbon, triplum (a triple sec liqueur), almond syrup, fresh lemon, tiki bitters, and a smoked sea salt rim. Ours came without the rim, unfortunately, but was flavorful enough without it, a tart, concentrated, creamsicle with a woody bite like licking the end of a popsicle stick. 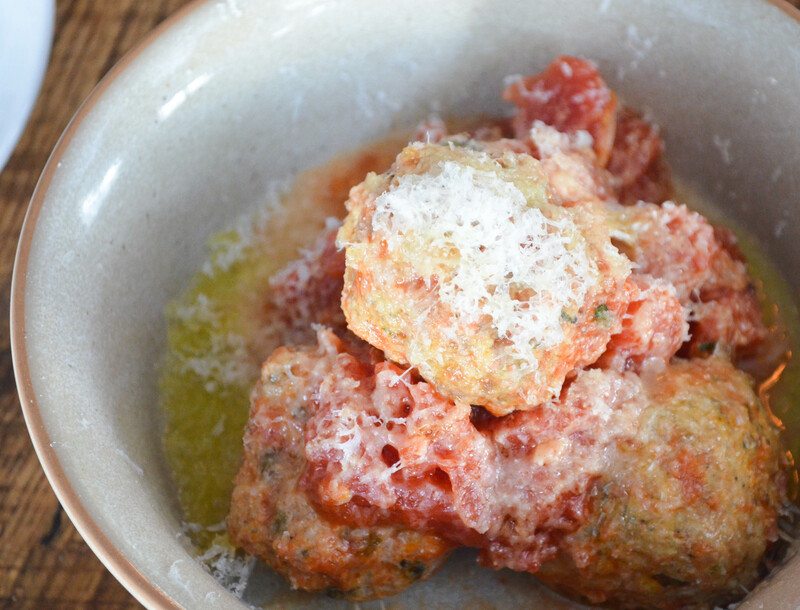 Meatballs came out in a rustic ramekin, fluffy, large orbs with ricotta on top, in the sauce, and blended into the meat itself. I speared one and watch the rest disappear in record time. 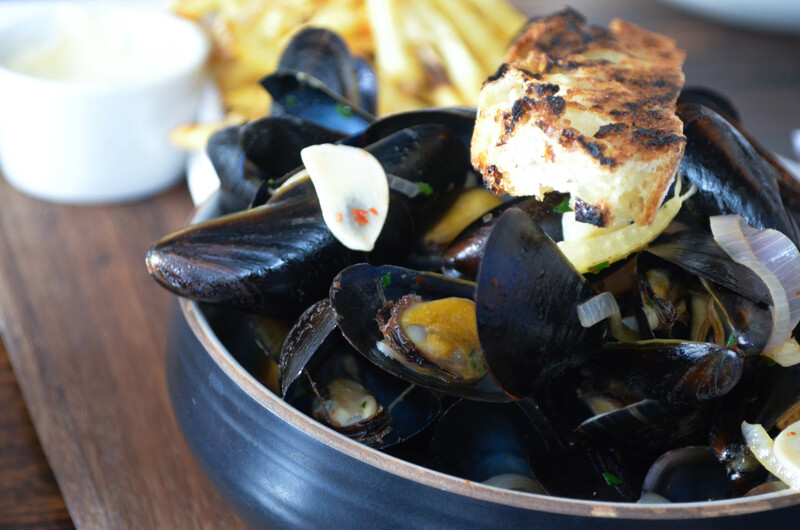 A portion is generous, and comes with four golf ball-sized pieces to share or hoard. 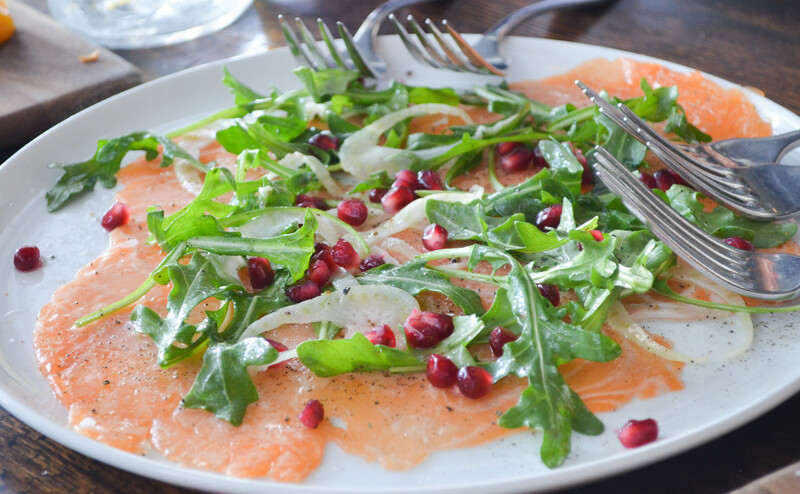 We were also given the chance to sample a yet-unlisted appetizer, salmon carpaccio with pomegranate seeds, arugula, and shaved fennel. Salmon is probably my favorite protein, and this was a very tasty example. Although it wasn’t explicitly mentioned, it tasted as if it had been cured. The combination of the fish and the berries gave a rather Scandinavian flair to the dish. 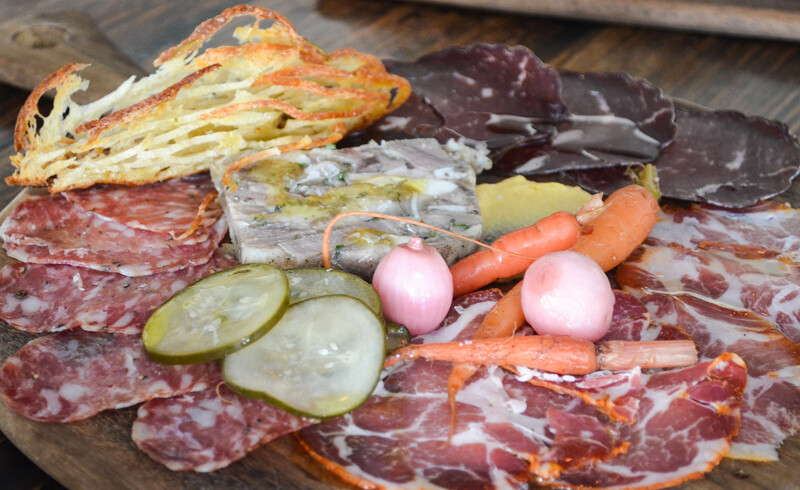 For our final appetizer, we noshed on a big ol’ plate of charcuterie– a familiar face to the Bedfellow and I. Outstanding pickled vegetables, but the clear winner, head and shoulders above the rest, was the housemade head cheese. It was as chunky and flavorful as they come, with a lipsmackingly porky, fatty flavor, amplified by a glug of olive oil. 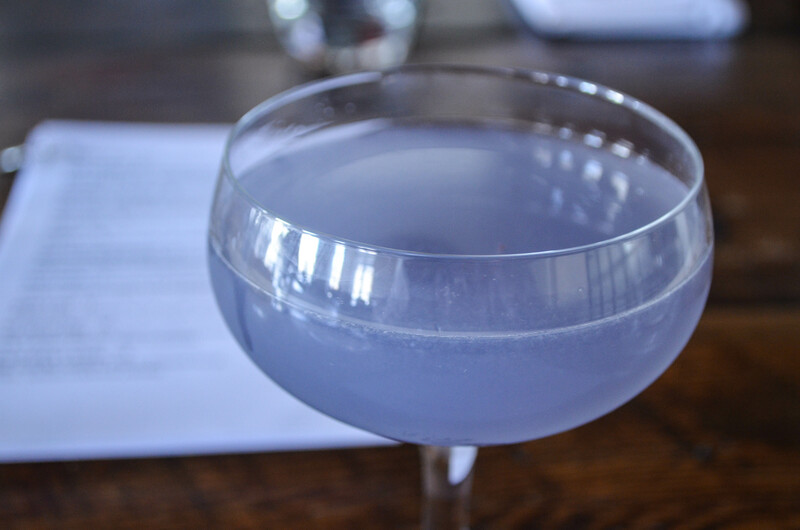 Our last drinks of the afternoon were the Paper Plane, not pictured, and the Black Dahlia. 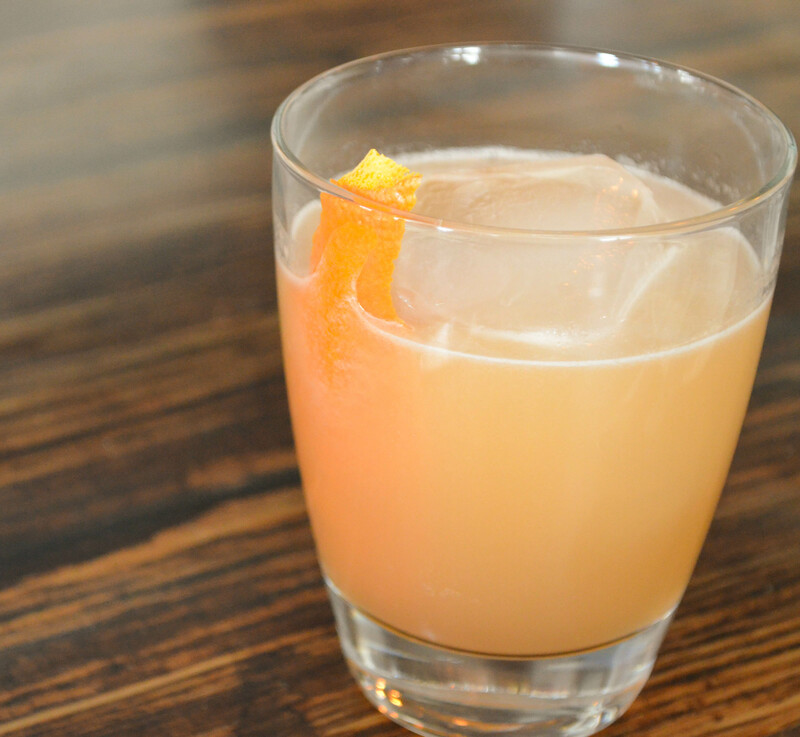 The bright orange Paper Plane had bourbon, amaro, aperol, and lemon. A classic flavor profile on a relatively new drink that has made quite the splash in bars lately. My Black Dahlia was tastefully sweet, with tequila, ginger liqueur, creme de cassis, lime, and mole bitters, though the predominant flavor was definitely the cassis and lick of spice from the ginger. Oh yeah- entrees. We each picked our own entree, but everyone was gracious enough to allow extensive photography. 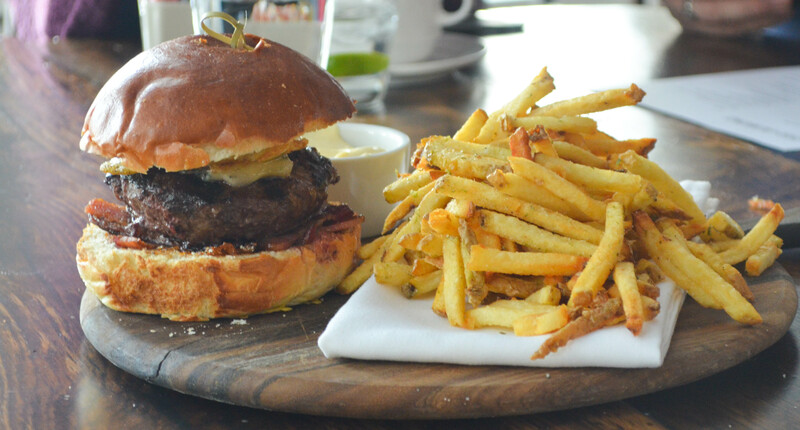 I tried to stick to my own plates, but couldn’t resist getting a shot of this fine-looking burger and fries. I could barely eat these mussels. Actually, that’s a lie, I ate them all, every last spicy, sweet sucker, and not a one was closed. The fries were a little too crunchy for my taste, I prefer a little meat on my ‘taters, but appreciated the malt-laced aioli on the side, rife with mustard seeds and vinegar. 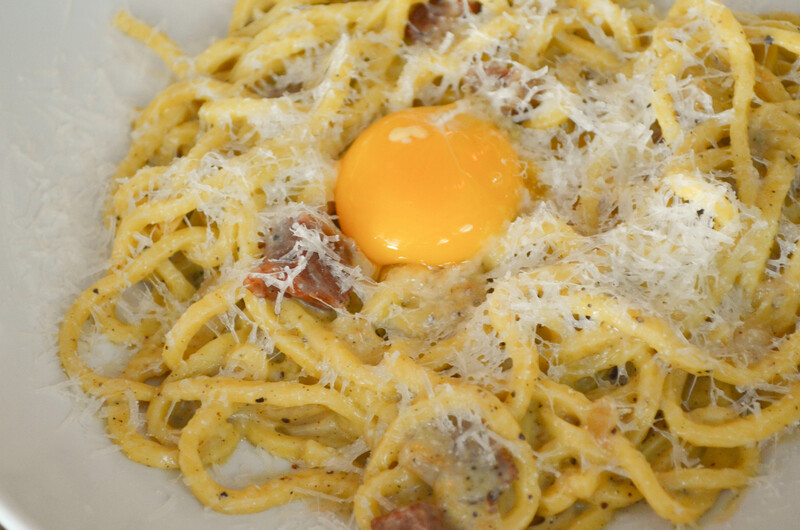 I restrained myself from diving headfirst into the Bedfellow’s chittara carbonara, but she was gracious enough to slip a bite my way. Nothing groundbreaking here, but a saucy, eggy, classic dish with big hunks of salty guancale and gooey parmesan to bind it together. It was visually gorgeous, and the pasta tasted fresh and homemade. 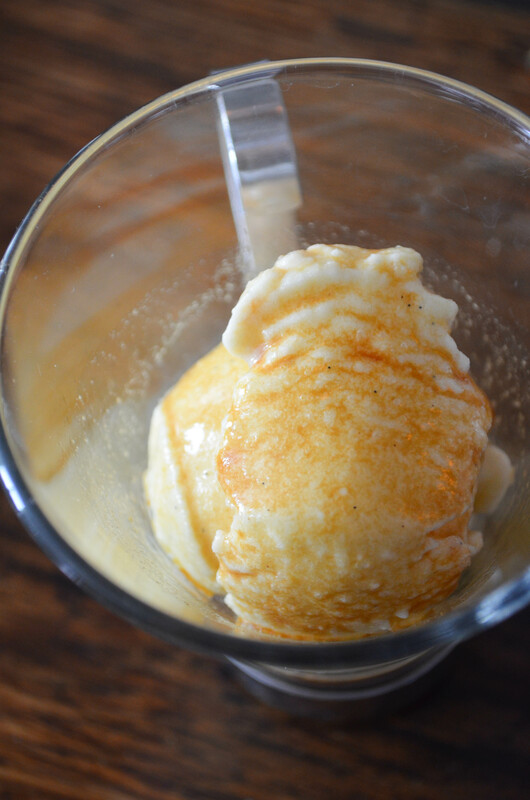 We finished our meal with a generous affogato- thankfully, more deep espresso than ice cream, as the latter was oddly grainy, despite having a marvelous flavor. 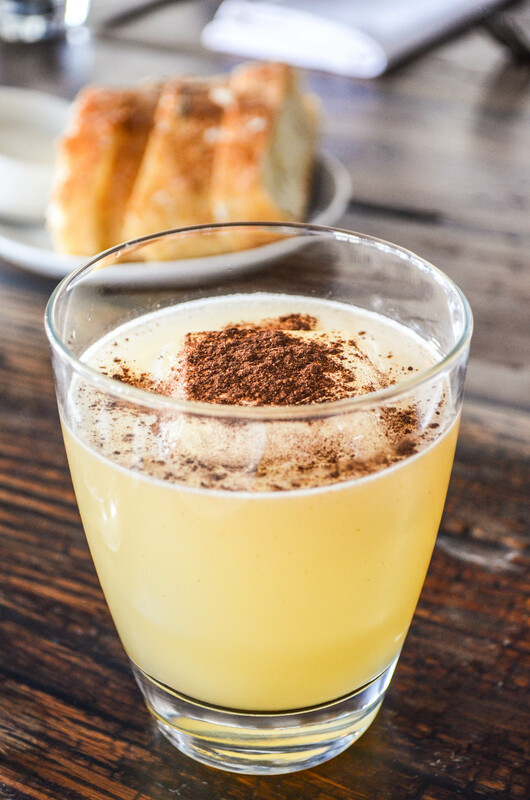 This is definitely a ‘destination brunch’ place- generous portions, nuanced flavors, and an eclectic selection of savories and sweets make it special, but the tightness of the drinks pushes it to a whole ‘nother level. We had to recover for a few hours in the Starbucks next door. That’s what I call a good brunch. Thanks again to the restaurant and their PR team for having us! Your photos look amazing! I can’t wait to try out their brunch. They’ve been on my list for a while. Thank you so much for sharing your experience! I live maybe 2 minutes away from this place, and haven’t tried it yet. wow! A friend has recommended this place, now I’m really going to have to try it! Those drinks look really unique… And delicious!